The Glass Case. You’re allowed to look, but never touch. You’ll never be able to afford those bottles, so why get yourself worked up? Just keep moving along to your bottle of Old Crow in the back next to Early Times and give the cashier your ten bucks and go home. The rich dentists laugh at you as they select yet another bottle of Macallan 50. They may even have their own key to the Glass Case. You don’t. What’s the solution? Easy, just make that rich dentist your friend. Glenfiddich 21 Year Old is one of those famed bottles behind the glass. The Speyside single malt, originally called “Havana Reserve” is finished for a time in rum casks from Sancti Spiritus Distillery in Havana, Cuba. 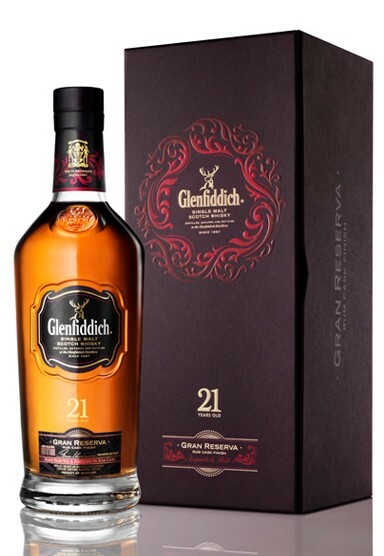 Worried about American consumer unease with the Cuban connection, the name changed to “Gran Reserva” then finally to the simple Glenfiddich 21 Year Old for label consistency in the core range. Any chance you get to try a well aged Scotch is one you should take, and the club took it. Let’s see what we got…. Nose- Right away musty oak. Whiff of sweet rum. Vanilla extract with molasses. Savory note. Pear with time and light citrus. Pot of caramel. Quiet aromas. Taste- Sweet, syrupy. Vanilla with light apple and coconut. Creamy and well balanced. Very drinkable. Finish- Oak comes back, tobacco. Dark fruits, sweet. Vanilla. Medium length. Comments- Aged very well. Well rounded and balanced. Calming but flavors are lively. With time the overall experience improves greatly. Very drinkable and enjoyable.